Normandy was created in 911 by a treaty between the king of France Charles the simple and a Viking chief named Rollo. This new settlers would protect Paris and the Seine river. After the Viking destructions, their heirs covered Normandy with many abbeys and castles. William the conqueror, the seventh duke of Normandy was the last one that managed to invade England. The Bayeux Tapestry, an artwork from the 11th Century is a remaining witness of this golden era. 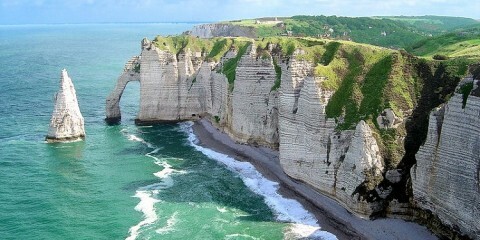 With 400km of Coast, it is France second largest fishing region. 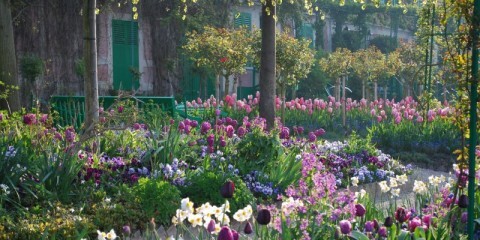 Its Eastern end starts just 40 miles West of Paris, the most famous village on this side being Giverny. 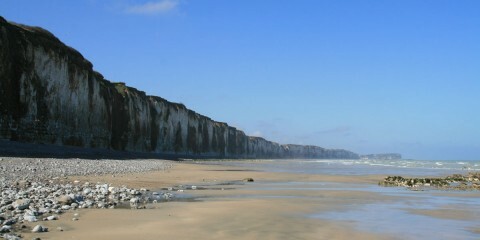 Normandy has a very large panel of landscapes. The loops of the Seine river in the limestone ground and the cliffs of Etretat benefit from a specific light that inspired so many painters. The Western has less forest and a granite ground. As all the houses used to be made thanks to local materials, the architecture varies a lot. 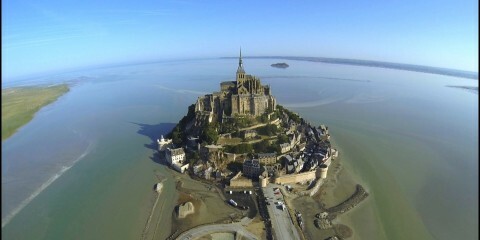 The most visited site of Normandy is the Mont Saint Michel. This tiny town witnessed the very first landing on Normandy on June 6th, 1944. The 6th British Airborne division were the only troops to land East of the Orne river and its canal. The Allies needed to secure the supply, reinforcement and relief of the airborne troops. The control of the bridges crossing the streams was needed. In order to prevent the Germans from blowing the bridges, the attack needed to be very sudden. The Ox and Buck landed by the bridges thanks to gliders (said to be “The most accurate operation of WW2”). This beach was planned last and is the only situated on the Cotentin (Cherbourg) Peninsula. The landing of the 4th infantry division on this beach is linked with the US paratroopers (101st and 82nd airborne divisions). Both the Paratrooper Divisions and the 4th Infantry Division were part of the 7th US corps under the command of General Collins. The main objectives of the 4th division was to link up with the paratroopers, relieve them and then prepare the next phase: pushing west to cut the Cotentin Peninsula and isolate the German defenders of the port of Cherbourg. The landscape behind the dunes lining the coast is flat and low-lying and had been permanently flooded by the German defenders. The German forces here were part of the 709th Infantry Division, a low-quality, static coastal defense unit. Thanks to the orientation of the beach (north to south), the flat landscape, weak German defenses and also a large piece of luck, the allies took far fewer casualties on Utah Beach than had been anticipated. There are many vestiges of the German Defenses left here along with numerous memorials, the most recent being a monument to the sailors of the US Navy. Operation Neptune, the amphibious part of the D-Day Assault was the biggest to date and during the fighting in Normandy in the summer of 1944 eight ships were sunk and 1,068 sailors and Coast Guardsmen died. 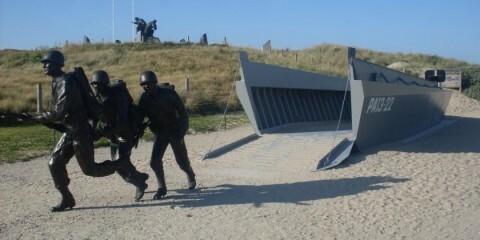 The first bunker assaulted on d-day is now part of the museum dealing with the landing of the 4th US Division. This small village on the river Aure turned into a major local city during the Roman era. 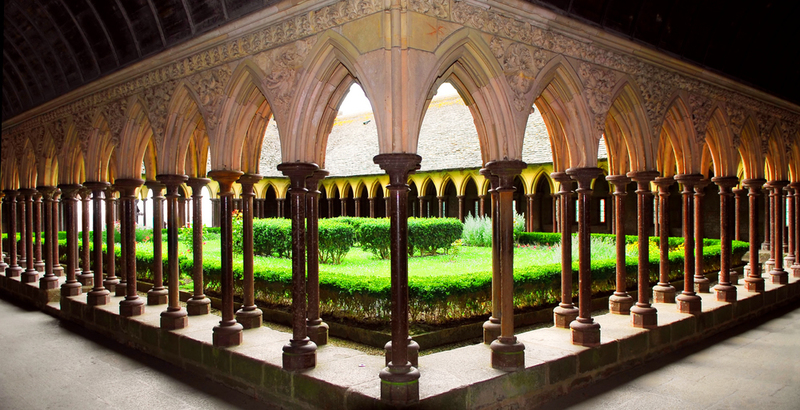 In the Dark ages and later Middle Ages as Christianity was expanding, the city became the seat of the bishop so a cathedral and many monasteries were built in and around Bayeux. Odon, the most famous of the Bishops of Bayeux, lived in the 11th century, took part of the battle of Hastings in 1066 and was actually the half-brother of William the Conqueror. Like many Norman Lords and church leaders of the time he became very wealthy and decided to use his wealth to build a new cathedral. He also decided that people should know the reason why William, his half brother and Duke of Normandy, had decided to invade England in 1066. Thus he commissioned a piece of embroidery to tell the story and also to decorate his cathedral. This embroidery was named “the tale of the Conquest” and was made in the 11th century but is better known today as the Bayeux Tapestry. Despite the years and it’s age of nearly one thousand years, the 225 foot long medieval depiction is in almost perfect condition and well merits a look. The town is one of the few places in Normandy that was unaffected by the bombing and artillery shelling of World War Two and suffered virtually no damage during the war. This high ground controlled Caen city. 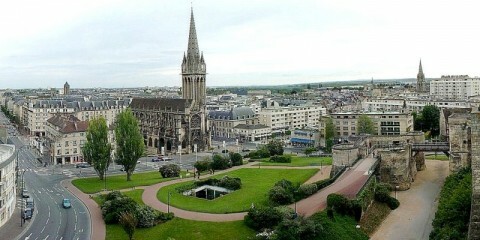 The liberation of the city of Caen would be useless as long as the Germans were able to keep control of this highground. Once he knew that German Tank division would soon strengthen the German lines and allow major counterattacks. The general Montgommery launched an attack on “Calvary Hill to keep the initiative in Normandy. During weeks, this No Man’s Land remains a key position in the battle of Normandy. 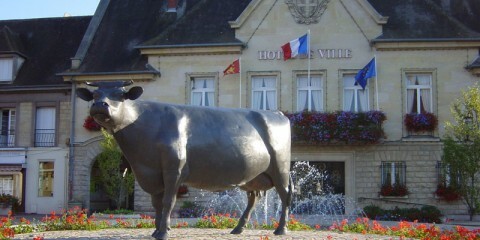 This rural town pays tribute to Marie Harel, the inventor of the Camembert Cheese (from the name of a nearby hamlet). Situated on the eastern end of the Falaise pocket, a German Tiger tank still can be seen on the high ground overlooking the town. The field marshal Rommel was injured outside a small nearby village in July 1944. The battle of Normandy ended in the “Falaise pocket”, a triangle between Falaise, Argentan and Chambois. The pocket was closed when the US troops linked up with the Polish first Armoured in Division in Chambois. The highgrounds of Montormel (Hill 262) allow view on the last battlefield of the Battle of Normandy. Mortain used to be a very important town during the middle ages. It was on one of the many routes to the Mont Saint Michel. From the high ground that dominates the town, the pilgrims could see the famous Mount for the first time, it was named Montjoie or the Mount of the Happiness. This position was named Hill 314 (and 317) during WWII. The “lost Battalion” from 120th Regiment resisted to all the German attacks during several days. These men were re-supplied by planes and even by recycled smoke shells from the US Howitzers. By holding this high ground, the observers could communicate the German position to the artillery. They were then stopping the German Counterattack codenamed Luttich from the 6th of August 1944. A few days after the liberation of the ruins the breakout was made possible. Surrounded by marshes, Carentan is a little town on the main road (one of the few paved ones in the area) between Omaha and Utah beaches. The Allies needed to capture the town to link up the Vth and the VIIth US Corps. 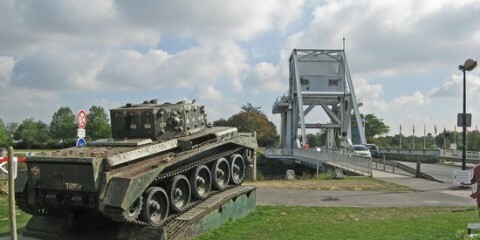 To the Germans, it represented a key crossroad between Caen, Cherbourg, Brittany and the Loire Valley area. The allies planned to liberate it on June 7th. 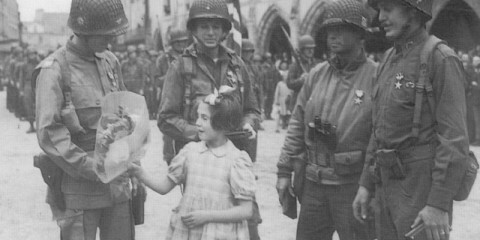 The paratroopers from the 101st Airborne Division captured the town on the 12th. They suffered a German counterattack on the following day. This town which was destroyed at 80% remained close to the front line until mid July. To see now : the Ingouf farm, several monuments and some buildings that could be restored after the war. On D’day, the paratroopers were scattered all over Normandy. 200 men from the 507th PIR escaped the floods of the Merderet river and gather in a tiny village on the high grounds overlooking the marshes. Several of them were saved by the villagers of Graignes. During the next days, the paratroopers engaged forward elements from the 17th SS Panzerdivision. On the following Sunday, the Germans launched an assault on the village. After the battle, the Germans executed wounded soldiers and civilians including the priest and his deputy. They later destroyed the church and most of the nearby houses. The remains of the church stand on the top of the hill overlooking the marshes. Situated on the high grounds east of the Orne river, this village was the very first one liberated by the Allies on D’day. Very soon, the general Gale set is headquarters in the school. Stain glasses inside the church are dedicated to the airborne division. In the nearby cemeteries are buried the first liberators that made the ultimate sacrifice. One of the missions of the 101st Airborne Division was to silence the canons which were controlling the causeways, the only exits from Utah Beach to the firm ground. This private property is still owned by the same family nowadays. During the occupation, the Germans flooded permanently the low grounds aroud the Merderet river. This tiny srteam became a wide shallow lake. To cross it, only to roads and bridges remain. The crossing was essential to the allies to go westward and thus isolate the deep water port of Cherbourg. To seize these bridges intact was the mission given to the 507th and 508th Paratroopers Infantry Regiments. The battle on the 2 bridges (La Fiere and Chef du Pont) lasted 3 days. 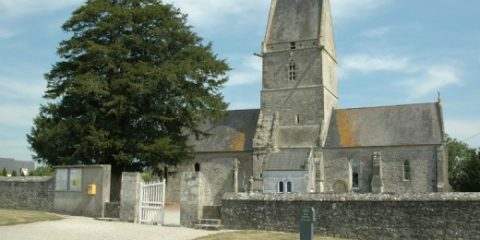 To see now : the bridge, the restored Cauquigny Chapel, several monuments and markers that pay tribute to the sacrifice of the men from the 82nd Airborne Division including to Charles de Glopper, the only private to be awarded a Medal of Honor in Normandy. This tiny hamlet was the witness of fierce fighting during several days. On the first day, 2 American medics from the 101st Airborne division, Kenneth Moore and Robert Wright settled a field hospital in the parish church. They took care of US and German soldiers and a little girl. Despite the village several times, both belligerents respected the heaven of Peace. To see now : The pews that were use as stretchers are still here. New stain glass windows connected to the events of WWII now decorate the church. By 1942, the Germans had set up a battery of 6 guns on the top of 100 foot high limestone cliffs at the headland named the “Pointe du Hoc”. This battery was situated between the two US landing beaches and the range of the 155mm guns would allow the Germans to fire on both Utah and Omaha. These guns had to be neutralized before the beaches could be assaulted. Despite 1500 tons of bombs dropped on this site by Allied aeroplanes prior to D-day, it was decided to attack this long range gun battery with infantry. The battery was so well defended from inland that the assault would have to be undertaken from the sea. This meant that the attackers would have to climb the cliff first, a mission for the US Rangers, the new elite troops of the US army. The mission of companies D, E and F of the 2nd Ranger Battalion was to land at 6.30AM at the bottom of the cliff. If they scaled the cliff within the first half an hour and could send a signal from the top by 7AM they could then be reinforced- otherwise they were on their own. The plan was to silence the guns using thermite grenades, then gain control of the road half a mile inland where they would be reinforced by the troops arriving from Omaha beach. 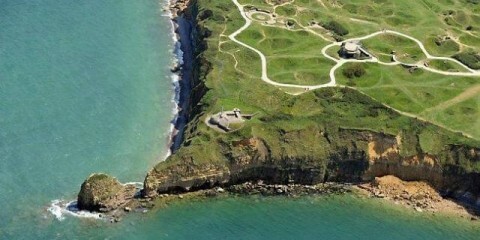 Due to an error of navigation, the first wave did not land at the bottom of the Point du Hoc until 7.10AM. They managed to scale the cliffs rapidly, and then found out the gun emplacements were only filled with decoys, disguised telephone poles. They moved inland where the Rangers managed to gain control the road, and during this Sergeant Lommel found real the guns that had been hidden in a nearby field. Quickly destroying the guns, the Rangers then settled in to wait for the relief force due to arrive from Omaha Beach at any moment. Although the Rangers were not relieved until the 8th of June, Colonel Rudder’s tiny force managed to retain control of the position for these 48 crucial hours. During these grueling days the Assault 3 companies suffered over 60% casualties. What to see now: A very impressive site with most of the craters from the air and naval bombardments still remaining to be seen. 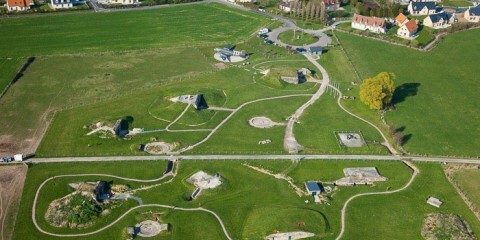 The Germans built a long range battery behind the small village of Merville Franceville on the East of the Orne river. The cannons were threatening the fleet off shore Sword Beach. Prior to the sea landing on Sword Beach, the colonel Otway and 750 paratroopers had to destroy the cannons. They were dropped around 1am. They would gather on the ground before attacking the German position thanks to a very complicated plan. Despite nothing occurred as planned, they succeeded in destroying the cannons. To see now : This site is a museum that presents the construction and the assault of the battery. A C47 is exposed by the bunkers and pillboxes. To secure the open flanks of the seaborne landing, the Allied planners decided to drop American paratroopers on the western side and British paratroopers on the eastern side to prevent German counterattacks. to control the high ground north of the city of Caen, the liberation of the city itself also considered to be one of the Allies highest priorities on D-Day. These British and Dominion paratroopers were to be dropped east of the Orne river and the nearby canal in the early hours of the morning of June 6th. All the seaborne landings of D-day would take place west of the river. Thus the very first operation for the British paratroopers on D-Day was to seize intact the bridges across the river Orne and the nearby canal, as they would be needed to ensure the reinforcement and the resupply of the Airborne troops. Allied intelligence had provided information that the Germans had installed explosives on the briges in order to ensure that they would not fall into Allied hands intact in the case of an attack. 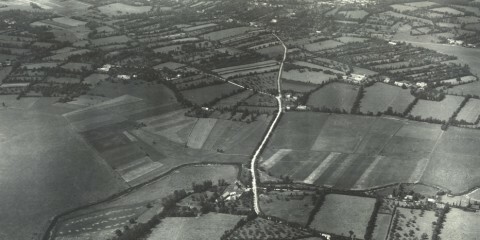 The paratroopers of the Oxfordshire and Buckinghamshire Regiment had trained hard to make a sudden attack and seize these bridges while the German defenders were still surprised. For this only gliders would be accurate enough to land all the men at the same time and place. The British designed Horsa gliders which were made of wood managed to reach the bridges with an accuracy and precision that is still impressive even when measured by todays advanced navigation standards, the closest landing only 147 feet (45 meters) from the bridge. The men, lead by Major John Howard successfully seized their targets intact and were reinforced by other paratroopers from the 6th Airborne as the morning wore on. The first seaborne troops to cross the bridges would arrive around noon with No 4 Commando under Lord Lovat, piped across the river by Lovat’s piper Bill Millin. 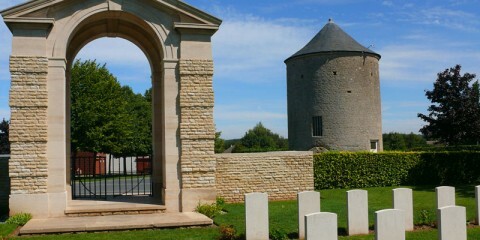 The Merville Franceville battery was to be attacked by Colonel Otway who was dropped with over seven hundred men of his Battalion around 1AM. However, once on the ground Otway could only gather about one hundred and fifty of his men. With little equipment and forced to use an improvised plan Colonel Otway and his men still managed to assault the battery and silence the guns on time. The bridges on the Orne river and on the nearby canal were renamed by the paratroopers on the following day. They are still known today by the names the paratroopers gave them: Horsa and Pegasus bridges..
Juno Beach was the second most heavily defended sector of the D-Day Landing Beaches after Omaha Beach. It was designated to be the landing area for the 3rd Canadian infantry division and the British 48th Royal Marine Commando. Their objectives included the linkup with both of the neighboring British beaches, Sword and Gold, on their left and right and the seizure of Carpiquet Airfield ten miles (16km) inland west of the city of Caen. 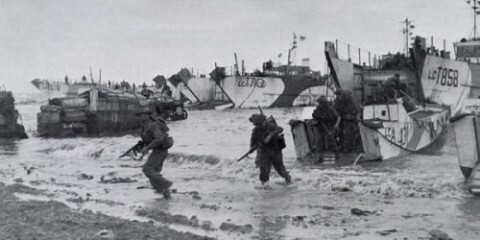 The Canadian objectives were to secure the landing beach areas. 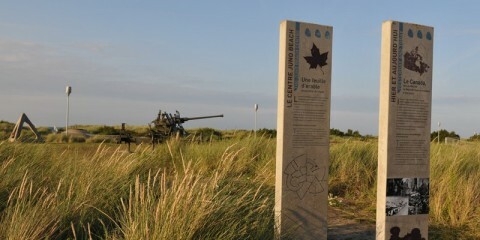 The 7th Canadian Infantry Brigade was to capture the seaside towns of Courseulles and Graye sur Mer. The 8th Canadian Infantry Brigade was to capture the seaside town of Bernieres and open the road to St Aubin sur Mer. No 48 Commando was to assault the strongpoint in the town of St Aubin sur Mer and to push east to link up with No 41 Commando coming west from Sword Beach. 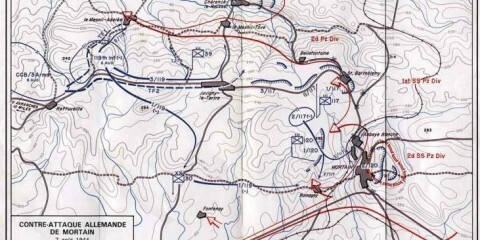 The 9th Canadian Infantry Brigade was to follow up and push on to Carpiquet and Caen. The landing was planned for 7.35am but was delayed by ten minutes to allow the tide to cover the reefs offshore. The German defenses were heavy in this part of the landing area but the quality of the troops was low. The Canadian 3rd Division took heavy casualties initially but managed the furthest advance inland by nightfall of June 6th. 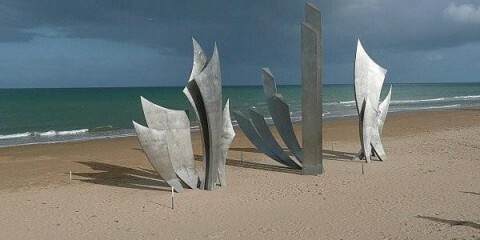 Sword Beach was situated on the eastern side of the beachhead on D-day. This beach, overlooking the western side of the Orne estuary was to be assaulted by the British 3rd infantry division, its main task being the liberation of the strategically important city of Caen on D-day. There are very few bunkers remaining. The coast along the Orne river estuary being a resort area since the 19th century, most of the German defenses and bunkers were removed shortly after the war. But there are still a few to be seen (machine gun nests, pillboxes,..), the most impressive being a five story Command Post which has since become a museum dedicated to the building and breaching of the Atlantic wall. 16 commonwealth cemeteries are widespread in Normandy following the itinerary and main battlefields of the liberation troops. the assault was to begin at 07.25 hrs. 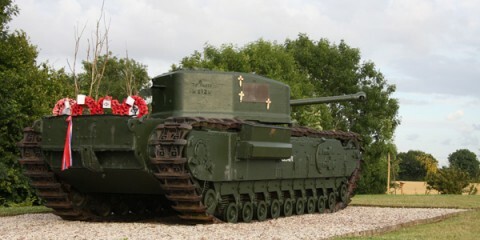 Duplex Drive Swimming Tanks and other specialised Armour was to be the first to land after a prolonged naval bombardment. the 69th Infantry Brigade to land on eastern end of Gold Beach at Ver sur Mer / La Riviere, secure the beach and push on as far south as the Bayeux-Caen road. 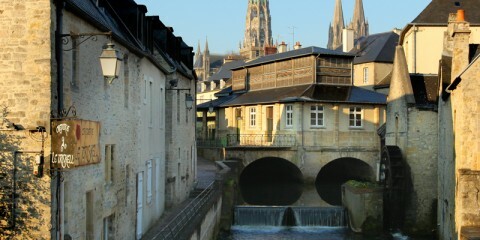 Bayeux was to be captured by 11.00 hours. 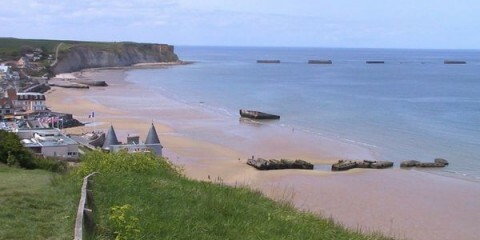 The 231st Infantry Brigade to land at Le Hamel, secure the beach then push west towards the small seaside town of Port en Bessin preceded by 47 Commando. As at Ouistreham on teh eastern end of Sword Beach, no direct sea assault was planned on the port installations. To protect the beachhead from German counterattacks but also to pave the way for the isolation of the strategic deep water port of Cherbourg, two US parachute divisions were dropped on the western flank of the seaborne landing areas. 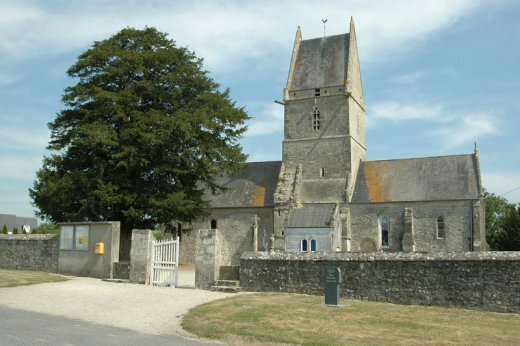 The 82nd “All American” division was to be dropped around and west of the small village of Saint Mere Eglise situated on the main North/South road in the area. These paratroopers also had to seize intact two bridges west of the village on the Merderet River. The control of these bridges would allow the allies to cut the Cherbourg Peninsula in two and thus isolate the port and weaken it’s defenses. The 101st airborne division main objective was to facilitate the landing of the 4th Infantry division on Utah Beach itself with its second objective to prevent counterattacks from the South. The allies biggest worry here was the 6th German paratroop regiment, the best German troops in the invasion area on D-Day. The locks controlling the water level in the rivers had been closed permanently by the Germans in order to flood the low ground inland from the Landing Beaches should the Allies land there. Unfortunately many paratroopers, overloaded by their equipment, ended up drowned in these marshes. However, the landings though costly were successful with Sainte Mère Eglise being the first village liberated by US troops in Franc, the action later depicted in the movie “The Longest Day” made in 1961. 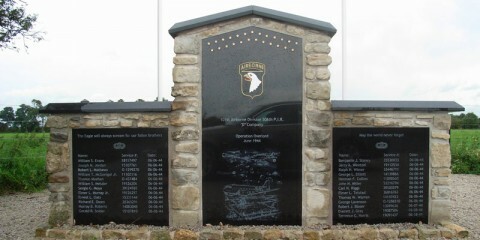 The HBO “Band of Brothers” serie also highlighted the mission of Easy Company, 506th,101st Airbone division. Omaha was the designated landing zone of the 1st and 29th US infantry divisions. Their missions on D-day were not only to secure control the beach itself but also to clear the area as far west as Isigny (8 miles) and as far east as Port en Bessin (5 miles) to link up with the British. The beach itself was overlooked by high sandy bluffs with 5 valleys running south from the beach providing breaks through the bluffs. The German defenses were mostly on the top of the bluff and the US troops would have to get close enough to neutralize them. Half of the German defenders came from the low grade 716th Static Infantry Division. The average age of the soldiers in this division was 35 and these soldiers had no combat experience. However, the other 3 companies defending the beach were part of the 352nd Infantry division. This division was composed of what was left of 3 divisions that had fought on the Eastern front. These soldiers were young, well trained, had a lot of combat experience from their time on the eastern front and were also very well equipped. An airstrike and a forty minute naval bombardment had preceded the landing, and according to the plan, the German defenses should have been neutralized and the beach cleared by 8:30am, 2 hours after the first landings on the beach. The Normandy American Cemetery now overlooks the eastern end of Omaha Beach. This cemetery is the biggest US war cemetery of Normandy. It holds the graves of 9387 soldiers that sacrificed everything for freedom. As all US cemeteries outside America it is maintained by the ABMC. This small town by the historic River Epte and the Seine River, between Rouen and Paris was the living place of the painter Claude Monet between 1883 and 1926. He lived there hlaf of his life! As soon as a could afford it, Monet bought the house and modified the garden. Inspired by the Japanese paintings, he even created a pond and had a Japanese bridge built. The house and the garden of Claude Monet were restored. It is now possible to visit them, the colors inside the house and the pieces of furniture copy exatly the one choosen by Claude Monet. This castle was not built on a high ground but in the middle of marshes. This humid ground helped to better the moat, main defenses of the stronghold. Surrounded by legends, this castle hosts a piece of embroidery, inspired from the one of Bayeux. This one tells about the conquest of Sicily by the Norman lords in the 11th Century. To see now : Restored during the start of the 20th Century, it is privately owned but open to the public. In French, “Falaise” means “cliff”, in this case a rock outcrop overlooking a valley, and was thus a very good defensive position and has been inhabited for thousands of years. 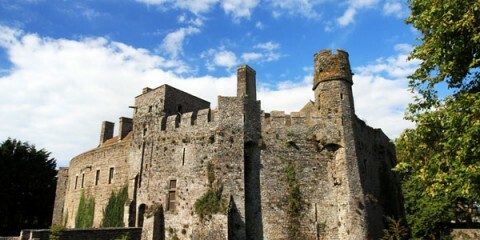 The Dukes of Normandy continued this and decided to build one of their castles there this castle on a cliff becoming the birthplace of William the Conqueror. 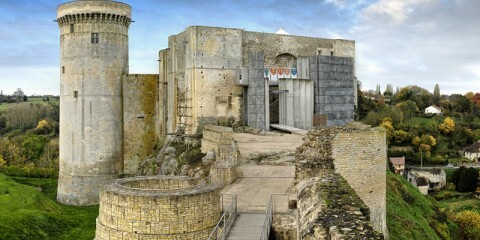 The castle of Falaise as it is seen today is a typical example of the evolution of military architecture and warfare in the middle ages and is ironically situated close to the site of a very recent battle where the final few days of the Battle of Normandy took place in 1944. After the Val es Dune battle in 1047, the young duke William imposed to his vassals the “Peace of God”. The main palaces of the Duchy where still in the North and the East of Normandy. In order to control better the Western side of Normandy, he decided to built a castle on the Orne river by a small town of tanners. Very soon the Duke’s town grew round it. It was later surrounded by ramparts. After he married Matilda of Flanders against the will of the pope, William had to negotiate his way to heaven. He would avoid excommunication by building 4 hospitals and 2 abbeys. The 2 monasteries were built in the proximity of the new castle. The 2 monarchs (William and Matilda) are buried in the abbey churches. Around the Men’s abbey grew the Abbot’s town (also fortified), around the Women’s abbey grew the Abbess’s town. Once the fortifications became obsolete, the extension of the towns was no longer limited. 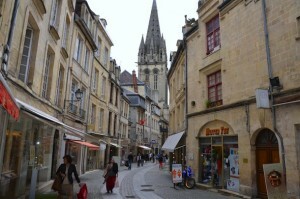 The 3 towns became Caen city. 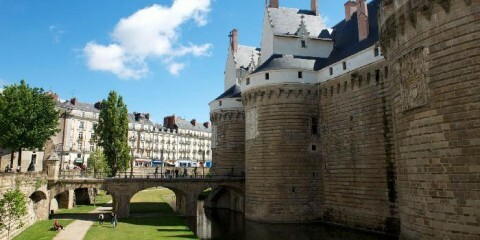 The medieval city was very badly damaged during the battle of Normandy. A part of the town remained on fire for 2 weeks after the first air strike on D‘Day. Fortunately, the main historical buildings survived and the city was rebuilt with the local limestone. The Mont Saint Michael is situated on the boundary of Normandy and Brittany and runs up to a height of 250 feet overlooking the bay between the two provinces, the bay having the highest and most impressive tides of Europe. In 708AD, Bishop Aubert of the nearby town of Avranches was visited in a dream by the Archangel Michael and told to build a sanctuary on the top of the mount dedicated to the Archangel. Thus this large offshore mount was dedicated as a monastic site and turned into a very active site of pilgrimage. The Abbey, situated at the summit, grew wealthy on the donations of the many pilgrims who came to visit and its architecture and magnificence grew as the centuries passed. A village sprang up around the Abbey at the base of the mount with strong defensive walls being added later as the site aquired a military strategic importance. On approaching the Mont St Michel today these walls still give a first impression today of a castle floating on the water. The 654 founded abbey was devastated by the Vikings but rebuilt thanks to their heirs. 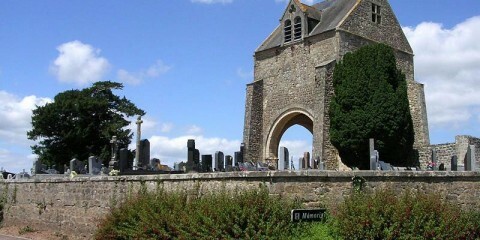 Nowadays church was dedicated by William the Conqueror. 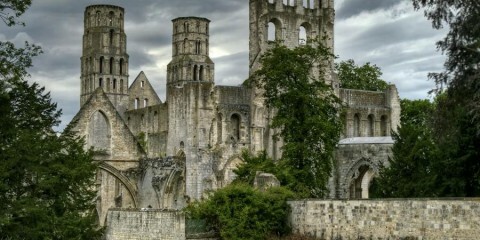 Unfortunately, the abbey sold during the French revolution was turned into a stone quarry for 30 years. The remains of the abbey are still impressive. 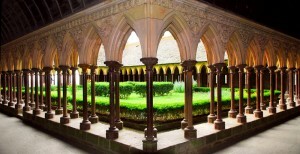 A 3D app allows to better appreciate the power of this monastery and the skills of the 11th Century builders. The first Norman dukes lived in Fécamp and built a castle in the town. This fishing town is now mostly famous for the Benedictine brandy. 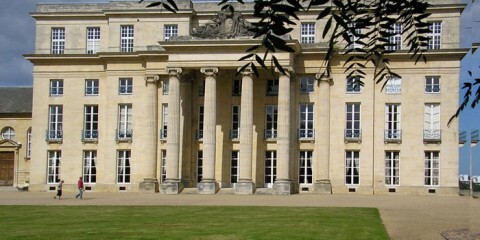 The inventor of the recipe, Alexandre-Prosper-Hubert Le Grand also built the palace of the Benedictine. In 1517, Francois the First, King of France developed a new Transocean port known today as Le Havre. 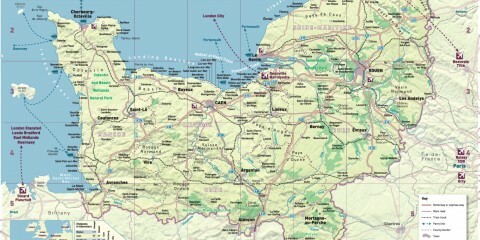 But before then then, Honfleur was the main port of the Seine estuary. Honfleur later gained fame thanks to the impressionist painters that used to paint the town and harbour and also used to stay in the Saint Simeon farm where they got cheap and food and lodging. There is a museum in the town itself dedicated to one of these painters, Eugène Boudin. He was among the first artists to paint outside and later met the young Claude Monet, introducing him to the importance of light in painting. Honfleur is most famous today for its port known as the “Old Dock” where the medieval trading ships and war ships used to tie up.. But the town has many other things to show to the visitor. 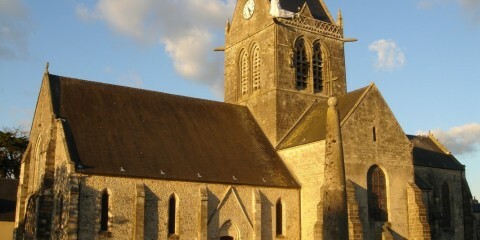 First of all, the church of Saint Catherine which was built at the end of the Hundred Years War. The population of Normandy had fallen by two-thirds during the Hundred Years War and so skilled stone-masons were scarce. The villagers decided that to build the church the local boat carpenters would be a good substitute. These carpenters built a wooden church, the roof of the nave can still be seen today to be the shape of an inverted ships hull. 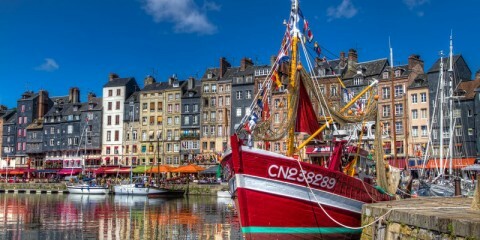 Honfleur today is now made up of a large number of Cafes, restaurants, Art galleries and shops selling local products. Rouen city was the first capital of Normandy designated as such after the peace treaty which was signed in 911 by Charles the Simple, King of France and Rollo, the Leader of the Vikings who were, at that point, threatening Paris. 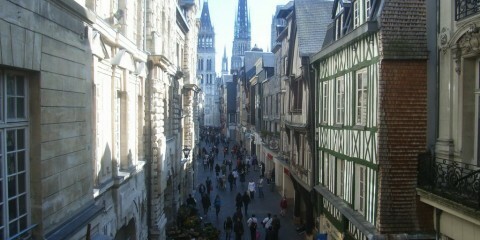 Rouen city was the second largest city in the medieval Kingdom of France. It benefited a lot from its position on the Seine River half way between Paris and the Seine estuary, with its port being deep enough for sea-going ships to dock there. Its woolen industry developed and gradually the town gained more and more wealth and thus more and more independence. 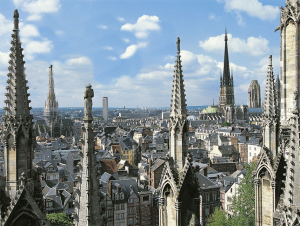 Owing to the number of churches built there the city of Rouen is also known as the city of 100 steeples. 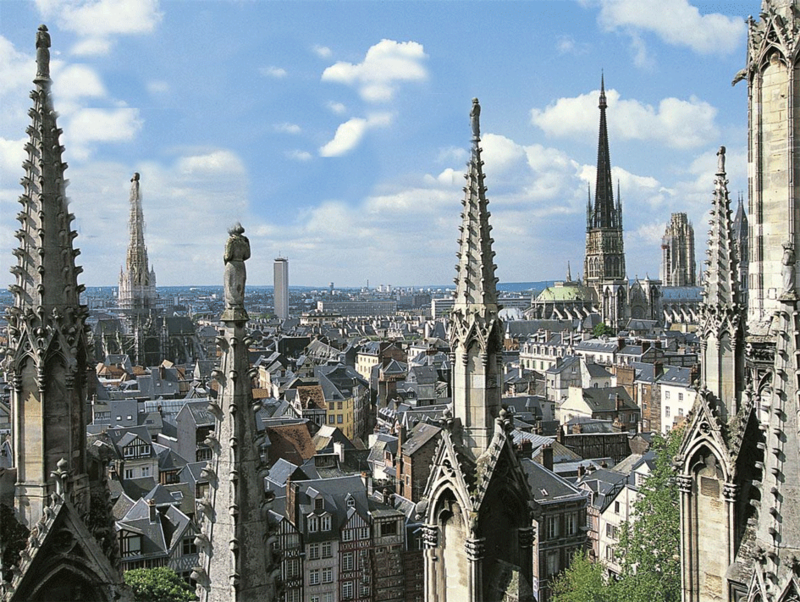 During the Hundred Years War, Rouen city was occupied by the invading English Army for 30 years. 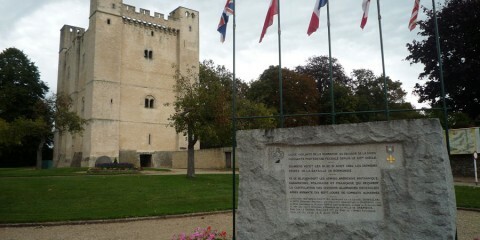 It was during this period that Joan of Arc was tried and executed in here. A monument now stands on the site where she was burned to death at the stake for being a witch.